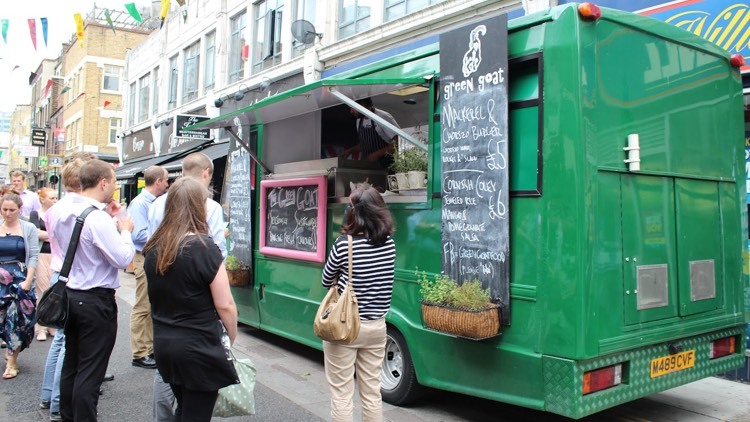 This week’s blog is written by our Business and Development Manager, Sarah Prentice, and continues with the street food theme of 2012. Our Creative Director, David James, and I were blown away once more when we strolled down ‘Whitecross Street’ EC1V last week, this is a street food market held every Thursday and Friday that just gets better and better, plus we love having a contract on the doorstep, so there’s always an excuse to visit! Not only is the food fresh, vibrant and tasty, but you can’t help but be fascinated by the trucks and kitsch vehicles they serve the grub out of. I’m also loving the big gold picture menu frames and herb filled window boxes on the vehicles, this is definitely an original way to write up your food offer. However I’m still searching to see a pink flamingo menu holder, so if anyone tracks one down please call me! This street is alive with people and atmosphere and the food is just so goshdarn tasty, so if you have got a spare fiver and fancy some great kerbside grub you must go and sample the wares. The stalls were themed from the food, to the stall and even the people working on them were in character. We even saw the winners of Young British foodies: ‘Street Food of the Year 2012’ in action. If you are free this weekend,15th and 16th September, why not visit Hoxton http://fifteenstreet.co.uk/about-bsfa.html as this is seriously where all the Street Food Gods and Goddesses will be. You will definitely find me here although I’m not sure which day to go – either Ginstock or Rumstock – decisions eh? You could even be sampling some award winning food, as this is where the judging takes place for the ‘British Street Food Awards 2012’. Do you have some comments to share about Street Food? Let us know using the box below.